American genealogical sources must be thoroughly researched before attempting to delve into the German records. Here are some statistics on the success rates of American resources that reveal German hometowns based on research by Dr. Roger Minert. In addition we recommended the following steps for finding the hometown of your German immigrant ancestors. Church Records - The FIRST PRIORITY is to find baptisms, christenings, confirmations, marriages and burials for your immigrants, their children and siblings in U.S. church records. The churches attended by German immigrants were usually very thorough in their descriptions of persons involved in the sacraments. Passports - If your ancestor traveled outside the U.S. their passport record may include their birthplace. Military records - Military records can be very revealing of German origins. Pay special attention to draft registrations especially World War I, pension files from the Revolution to the present and muster lists. Obituaries - Look in newspapers for your immigrants, their children and grandchildren. Newspapers especially in smaller towns include very detailed obits. The German language newspapers in the larger American cities will include many more details than the English language papers. Biographies - County, regional and state histories, Who's Who, professional journals and many other sources include biographies of early pioneers and prominent people. This is where descendants genealogy can be especially helpful. Look for biographies featuring your German immigrant ancestors and their descendants. These biographies often provide some details about the place of origin of the original immigrant. Death Certificates - Look for records for your immigrants, their children and siblings. Check the name of the informant to determine reliability of source. Gravestones - Look for all family, friends, associates & neighbors born in Germany. Naturalization Records - Helps to narrow search (i.e. Prussia, Bavaria, Brandenburg, etc.). · Catalog: Click on Search then click on Catalog to locate microfilm, microfiche, and online materials available through the Family History Library. On the Catalog search page, enter a place name to discover what records available for a specific US or German locale. · Research Wiki: Click on Search then click on Wiki to find research advice for specific World or US state, county, city, or town. Houston Public Library Catalog catalog.houstonlibrary.org Use this catalog or the catalog of your favorite genealogy library to see what books they have. Google Use search engine www.Google.com to identify additional church record resources. Google Translate Use www.translate.Google.com to past in German text and get an English translation. Germany as a country did not exist until 1871. Prior to that time it consisted of many large and small independent entities, including states, kingdoms, duchies, principalities, and others. Each entity was a separate “country” with a unique government, laws, money, measures, and so on. These various geographic areas are called jurisdictions. Record-keeping jurisdictions are places where a government or church has authority. Jurisdictions are used to identify a given locality and find records. Place names in Germany are often used more than once. Finding the right place is critical to finding the right records. · Available free at Ancestry.com and FamilySearch.org Go to website https://familysearch.org/learn/wiki/en/Germany_Gazetteers to get access. ü Historic German Genealogical Gazetteer online database http://gov.genealogy.net Use to determine place locations, former names, past affiliations, and related churches, church districts, places, districts, and regions. ü Kartenmeister www.kartenmeister.com Use to identify former Prussian towns and current location information. Scroll down to the bottom of the page to find the search box. 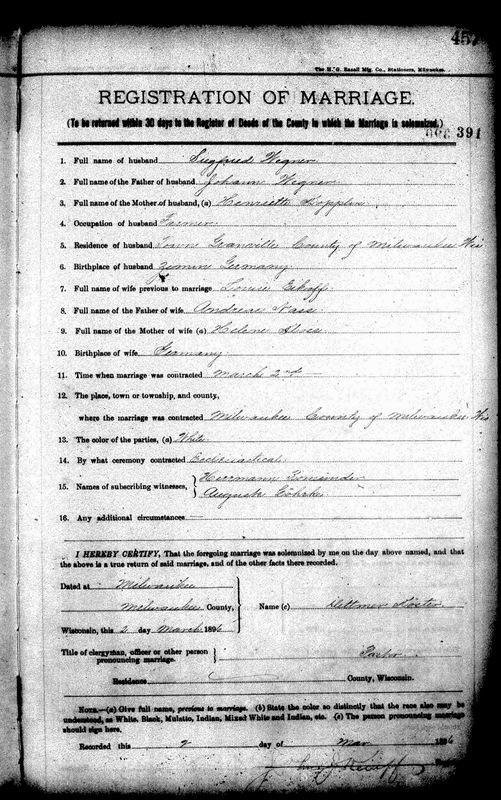 The following marriage record is being used as a case study for the upcoming church record lecture and workshop. The birthplace of the husband is shown as Zemmin, Germany. The 1870 census for Siegfried Wegner reveals he was from Pomerania. This marriage record also states the name of the pastor. Come to the session on April 18 to find out more about what this record has revealed. What a GREAT post! Thank you so much. I have German ancestors who immigrated to Columbus, Franklin County, Ohio. So much to learn.